Hanna: Original Motion Picture Soundtrack is the soundtrack album to the 2011 British-German thriller film of the same name, directed by Joe Wright. The original score was composed by the British big beat duo The Chemical Brothers. Initially the album was only released digitally, but it was released on CD on 4 July 2011. NME ranked the album at number 54 in their list of the "61 of the Greatest Film Soundtracks". "Container Park" was released as a free download after the release of the initial download of Hanna and before the later CD release. The soundtrack received mostly positive responses from music critics, with many praising The Chemical Brothers for having produced solid background music. However a few critics have cited a lack of experimentation as one of the flaws. According to Metacritic, which assigns a normalised rating out of 100 to reviews from mainstream critics, the album holds a score of 65, indicating "generally favorable reviews", based on seven reviews all compiled from critics. Chad Grischow of IGN reserved high praise for the soundtrack, feeling that the "duo nail the mix of violence and innocence". No. 77 in the iTunes UK chart (download release). No. 7 in the US Billboard "Top Electronic Albums"
No. 11 in the US Billboard "Top Soundtracks"
1 2 Hanna (soundtrack) at Metacritic Retrieved 11 November 2011. ↑ O'Brien, Jon. "Hanna". Allmusic.com. Retrieved 11 November 2011. ↑ Megan, Ritt. "Album Review: The Chemical Brothers- Hanna OST". Consequence of Sound. Retrieved 20 May 2011. ↑ Graydon, Danny. "Hanna". Empire. Retrieved 4 June 2011. 1 2 Grischow, Chad. "The Chemical Brothers: Hanna Original Motion Picture Soundtrack Review". IGN. Retrieved 17 April 2011. ↑ Phillips, Nathan. 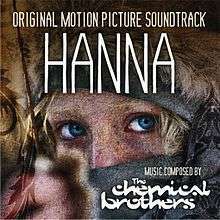 "The Chemical Brothers – Hanna Original Soundtrack". Metro Times. Retrieved 2 June 2011. ↑ Gaerig, Andrew. "The Chemical Brothers: Hanna Original Soundtrack". Pitchfork Media. Retrieved 17 April 2011. 1 2 Schiller, Mike. "The Chemical Brothers: Hanna (Soundtrack)". PopMatters. Retrieved 2 June 2011. 1 2 Henderson, Eric. "Original Soundtrack: Hanna". Slant Magazine. Retrieved 17 April 2011.